Since 2011 Canadian's have been able to receive digital TV signals over the air with an antenna. These transmissions are often in HD and are 100% free of subscription costs - i.e. once you have purchased the antenna and cable there is no additional cost to receive programming. Channel availability varies greatly region by region. scroll down for an estimate of the TV channels available to South Vancouver Island. Back in the 1950's and 60's the only way to receive television programming was with an antenna. In the early days of TV there were only 12 channels: 2 through 13 and all were on VHF frequencies requiring relatively large antennas for reliable reception. As the popularity of TV increased, however, the FCC in the US became inundated with license requests and it became clear that 13 channels would not be sufficient. The FCC's solution was to allocate additional frequencies in the UHF band. Broadcast television was initially allocated UHF channels 14 through 83, but when cellular telephones became popular channels 69 through 83 were taken away from TV stations and re-allocated for cellular telephone service. In recent years, TV stations around the world have been converting from the old analog transmissions to new digital transmitters. The reason for the switch is twofold; firstly digital transmissions use a lot less bandwidth or "space" on the radio spectrum, and secondarily digital transmitters can operate at much lower power, meaning a huge reduction in electricity usage. 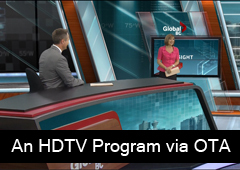 In both Canada and the US all full power TV stations have converted to digital transmission. It should be possible to use the same antenna to receive digital broadcasts as for analog as the two modes operate on the same frequencies - there is no such thing as an "HDTV Antenna" it is all a marketing tactic. The first question that most people have is "what channels can I receive?" The answer varies greatly from region to region, but in general all basic, local channels should be available. If you reside in Canada then this means you should be receiving Global, CBC, CTV, CBC French (if available) and CTV2 (if available). If you reside in the United States then channels like ABC, NBC, CBS, PBS, and FOX should be available. In most regions there will be other local stations that you can receive as well. If you're lucky enough to live near the Canadian/US border then you will likely be able to receive broadcasters from both sides of the border. If you watch a lot of programming on specialty networks like HBO, Discovery Channel, CNN, etc. then you may find that an over-the-air-only setup may not be for you, however many people have a basic cable/satellite subscription and augment the specialty channels with high quality, high definition programming available for free with an antenna. Antenna - choosing the right antenna can be difficult, the first decision is if you want an outdoor or indoor antenna. If you live any distance from local transmitters then an outdoor antenna is almost essential, conversely, if you're lucky enough to live near the broadcast transmitters then an indoor antenna is likely suitable. 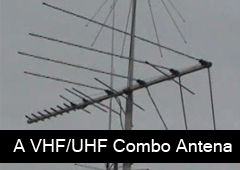 VHF or UHF - the next step in choosing an antenna is to figure out what channels your local stations broadcast on. 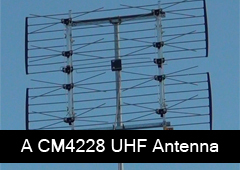 If you have any stations that broadcast on channels 2 through 13 you will need a VHF antenna to receive them. If all your channels lie between 14 and 52 then you only need a UHF antenna to receive them. Many antennas are made to receive both VHF and UHF broadcasts, these are called combo-antennas. There are a few models of UHF-only antennas which have the advantage of being much smaller than their VHF or combo counterparts. Digital tuner - many new HDTV's have digital tuners built right in so you just need to connect that antenna to the "ant in" port on the TV to start enjoying free over-the-air programming. 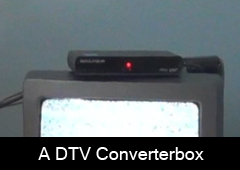 If you have an older TV that does not have a digital tuner you can purchase an OTA receiver which is installed between your antenna and your TV. Some tuners come with an integrated DVR to make recording TV programs a snap! You may also want to purchase a USB or PCI tuner card which connects to a PC and allows you to watch programming right on your computer. Cable - the final thing to consider is the cable used to connect your antenna to your tuner. Because OTA signals are relatively weak it is important to use high-quality RG6 cable to minimize signal loss. Channel number indicates the physical channel the station broadcasts on. Use this number when choosing an antenna. Displayed number indicates the number that will be displayed by a receiver (sometimes called a virtual channel). Some stations choose to show their pre digital channel number to align with station branding. Callsign is the callsign assigned to the station. Location is the city in which the TRANSMITTER is located and not necessarily the city where the studios are located. Antenna Needed is a rough indication of the type of antenna you will require to receive the broadcast in Greater Victoria.